Inspired by celebrity chef Rick Stein, James Innes Williams savours his surroundings as he cruises through Burgundy with European Waterways. It’s been five years since Rick Stein beguiled us with his French Odyssey book and television series, which detailed his discovery of real French food - cuisine de terroir - during a trip by barge from Bordeaux to Marseille. And yet, among the plethora of cookery programmes and recipe books, his account still sits fresh in the minds of many. In no small part this is due to his journey, his slow drift, along the canals and waterways of southern France, which gave plenty of time to savour countless meals in stupendously scenic environments. His journey lasted weeks as he travelled south along the Canal Latéral and then the Canal du Midi, passing along the ‘arcades of green shade from the overhanging plane or oak trees’. Stein writes too of the joys of ‘a constantly changing vista: a ruined chateau, then a distant village with church and spire, then yellow fields of corn and endless rows of vines running up the hills beyond’. By the end of his journey he had been swept up in the romance of slow travel by canal barge and his enthusiasm proved highly infectious to his television audience. 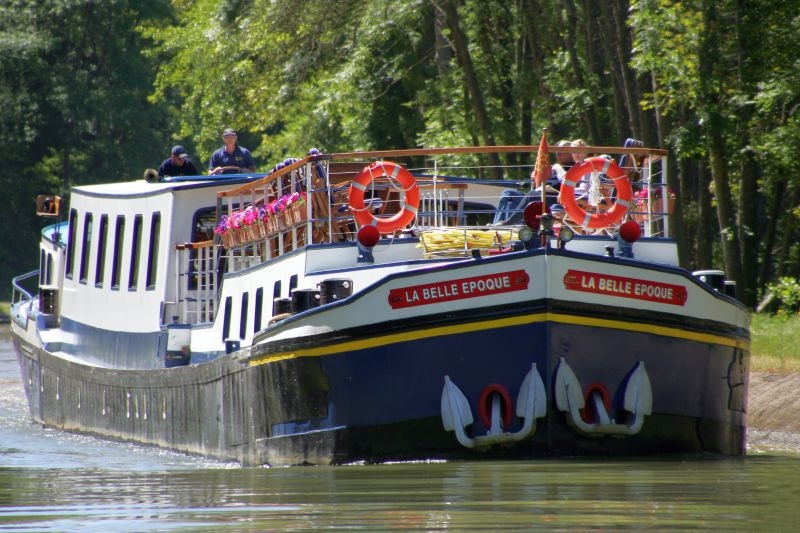 Stein had travelled under the guidance of European Waterways, aboard the Anjodi and Rosa, and this past summer I was asked to come and sample the delights of canal barging for a week, with a journey floating along the Burgundy Canal aboard European Waterways’ La Belle Epoque. These journeys are as much about the slow discovery of rural France as they are about delighting in its gastronomy. 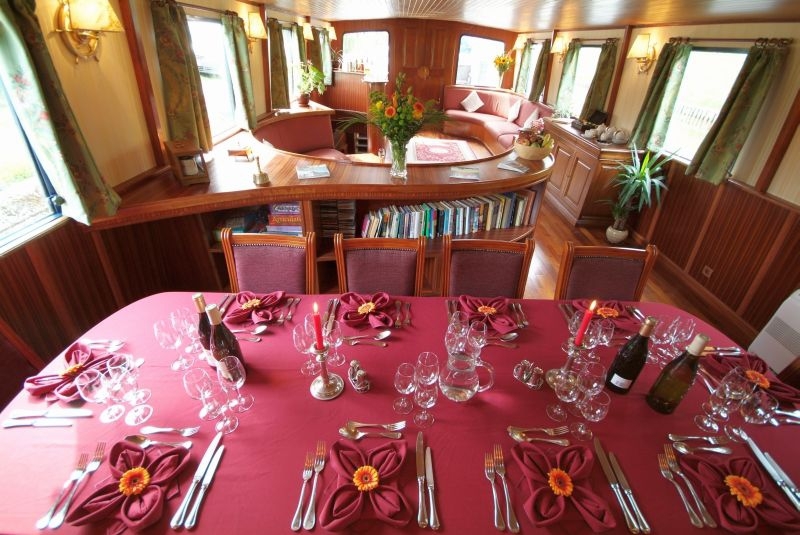 The boat’s crew of five includes a dedicated chef, who spends his days sourcing local produce from the markets and creating spectacular four-course dinners and sumptuous lunches, all of which are washed down with a local wine, picked to match the fine fare. So if you’ve come expecting the Rick Stein treatment, you won’t be disappointed. My introduction into the world of haute cuisine began as soon as I boarded the barge, with a few canapés and a glass of bubbly while the other passengers and I were familiarised with the boat’s layout - which, incidentally, seems much the same whether you’re cruising in Burgundy, Provence or further afield. We were then treated to the first four-course meal, setting the tone for the coming week - scallops gratin and smoked bacon to start, then chicken cooked in tomatoes with wild rice, two cheeses, a Morbier and Langres this time, and all rounded off with a delightful raspberry crème brûlée. The cheeses always featured some interesting story, and I especially liked the Saint Maure de Tourraine, which features a stick through its centre that brings bad luck if broken. Now, it would be quite easy to add a little weight to one’s midriff being treated like this every day, with generous breakfasts, lunches and dinners - and free flowing drinks - but the joy of pootling through the countryside at this gentle pace means you just want to get out and explore it even more. Throughout the day I was hopping on and off at locks to wander along the towpath in search of herons and other wildlife, or taking one of the barge’s bicycles to head further afield, exploring local towns, villages and wheatfields. Delightfully simple pleasures. Of course, I was also quite happy to let the barge do the work, relaxing on the sun deck and idling away the hours as we passed by charolais cattle and farmers tending to their fields. 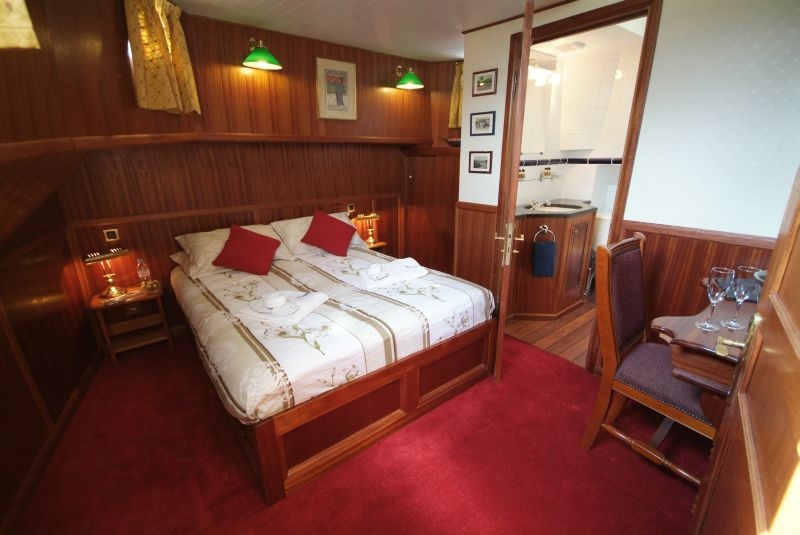 Inside, this old Dutch cargo barge was just as comfortable, the top deck converted to house the dining area and lounge, while the lower deck hosted six cosy cabins, each with its own en suite. 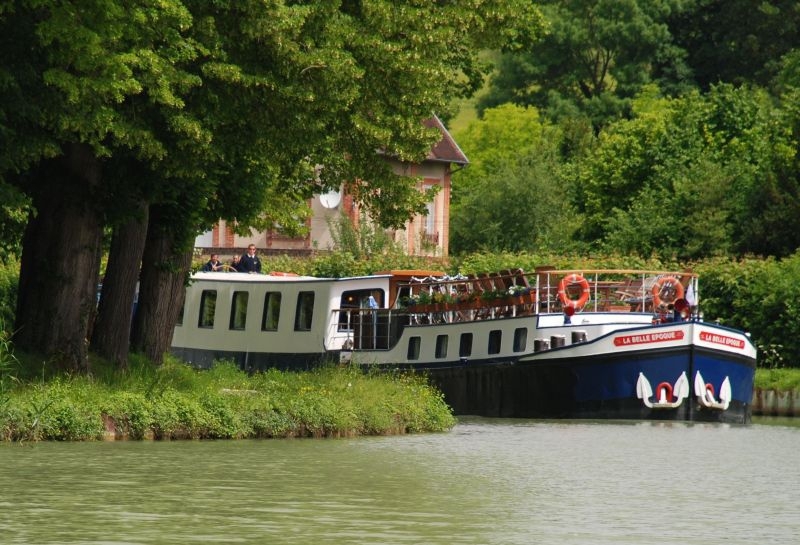 However, the European Waterways barging experience really comes into its own during the excursions. Over the week we visited chateaux in Tanlay and Ancy-le-Franc, as well as an abbey in Fontenay - now a UNESCO site - where Stephane, the captain, was able to take us on private tours and enchant us with stories of their interesting histories. He took a real delight while leading us around Chateau d’Ancy-le-Franc as he revealed hidden rooms and secret bookcases, with a glint in his eye, and then pretended to trap one of our number in a darkened, supposedly haunted room. The efforts of the crew really did excel throughout the week. Working all hours, they made sure we were kept entertained, introducing us to games of pétanque on the canalside and warming the hot tub on the sun deck at night. A special mention should go out to Rudy, the first mate, who among many other things was mostly seen running up and down the deck tirelessly every day to tie up the barge in each lock and then open the heavy lock gates. On our return from medieval Noyers, we passed by a fawn that had been struck by a car and had broken a leg. He looked after that poor creature while we waited for the local pompiers to take it to a vet and see if it could be saved, or, as they said, made into a good pâté... We asked Stephane whether he would have done the same thing, as we were all very impressed. "Yes," he said, "only better." It summed up the perfect camaraderie. From special wine-tastings in Chablis, trying out Grand Cru and Premier Cru varieties, by way of tours around medieval towns such as Flanery - the setting of the movie Chocolat - to simply relaxing on the sun deck, ducking under low bridges and spotting coypu in the canal, it was truly one of the most relaxing weeks ever. Certainly I could have explored the whole area in a day or two, but I wouldn’t have experienced it. The romance of the region, of any place, is in taking the time to let it seep in, in savouring the slow drift.